Over 100 world leaders will meet in Rio de Janeiro this week for the U.N. Conference on Sustainable Development, popularly referred to as Rio+20 Global Earth Summit. It is being held amidst “‘a world running low on drinking water and productive land’ and set against the backdrop of accelerating global warming, climate change, chemical contamination of air, land and water, drinking water depletion, extinction of forest and bio-diversity organisms, extreme weather events, energy insecurity, ocean acidification and environmental degradation.” The current growth process has devastated natural resources and habitats, created environmental refugees and is, today, posing a serious threat to continuation of life on planet earth itself. 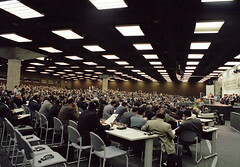 The Rio+20 meet is taking place 20 years after the 1992 First Earth Summit, when more than 120 heads of state met against the background of imminent ecological disaster caused by a development paradigm based on unlimited growth and industrial expansion premised on the limitlessness of natural resources. “Sustainable development” — growth which does not endanger the rights of future generations to access and enjoyment of the same resources — came to be accepted as the test for deciding the path of all growth and development processes. Protecting environmental resources, empowering marginalised communities and a central role for public institutions remained the central pillars of the Rio 1992 approach. The failing of the “sustainable development” model was that it created a false understanding that “sustainability” was possible without having to counter the logic or model of industrial society with its paradigm of accumulation of capital. The Rio+20 document seeks to create an architecture of environmental protection by placing an economic value on nature and natural processes. Nature would be treated as “products” to be traded in “commodities and futures” markets, open for speculation in the “derivatives” markets. Similar to “carbon credit trading,” those who damage nature in one region could continue environmentally damaging processes by growing forests in some other part of the world to earn “natural resource” or “bio-diversity” credit. What the new “Green Economy” is putting forward is the notion that it is because nature and nature’s resources are not “valued” that people abuse nature. The heart of the new UNEP “green economy” paradigm is a corporate-led, evolved and inclusive vision of the future of the planet. This definitional paradigm is, however, destructive, dangerous and damaging. The Green Economy proposes that a financial value be placed on “nature” and, what the paper calls “Nature’s Services” like clean air, water, trees, fruits and so on. In simple words, what the Green Economy proponents propose is that organisms like “bees, butterflies and birds” act as nature’s service providers providing “services” like pollination, fertilization, seed germination which today, they say, is done free. If these services are “priced” they can be made available for sale in the “biodiversity” market! Thus, once ecosystem “services” and biodiversity “goods” are priced and can be sold and purchased like any other commodity, new markets in ecosystems and biodiversity will be created. The voluminous 600+ pages of the Green Economy document pays pious homilies to the sanctity of the environment and the need for eco-restoration. But not even once does the report acknowledge that today’s crises have been caused by dangerously polluting industries, the extractive mining sector, chemical industries or industrial agriculture. The fixation with corporate-techno-managerial solutions presented by the UNEP report stands out against the poor respect and recognition given to traditional knowledge systems for governing the commons and customary practices of managing waterways, forests, bio-mass and seas. The core issue of a true green economy, however, is the fundamental principle that all natural resources belong to the global commons and are too critical for life to be commoditised or financialised, to be determined by the fickle world of markets.